Minneapolis, MN – November 11, 2016 – Alliiance is honored to announce that the Minneapolis-St. Paul International Airport (MSP) restrooms have been awarded Cintas’ 2016 “America’s Best Restroom Award.” The restroom submissions were judged based on cleanliness, aesthetics, innovation, functionality, and unique design elements. Ten finalists were selected and then the public voted for their favorite restroom online. The Alliiance-led design team surveyed all 100 public restrooms in MSP to assess their condition and ADA compliance. 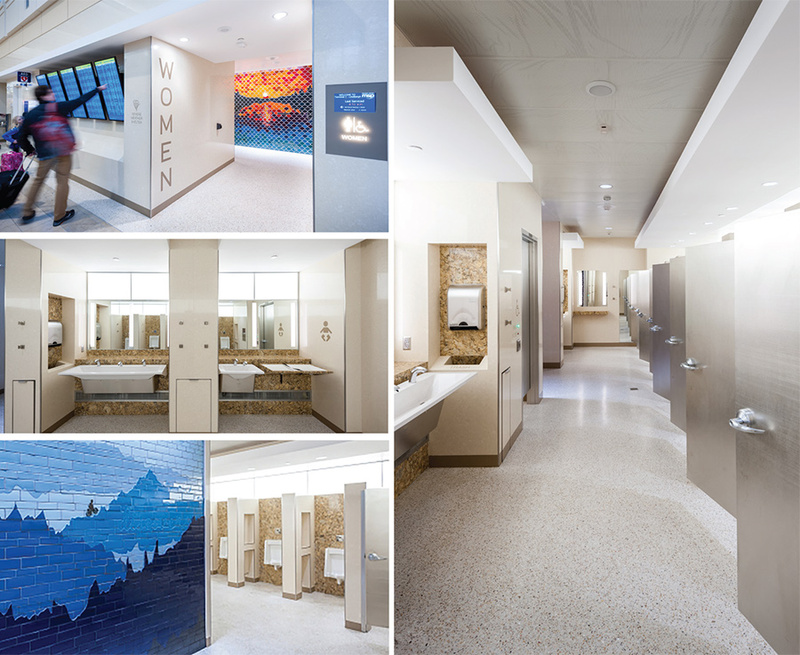 Over nine months, the design team and representatives from airport planning, trades, customer service, procurement, cleaners, and vendors analyzed and debated every aspect of the restroom. This exercise led to the development of a new prototype, designed to be integrated in a complete universal planning module throughout the airport. Some of the design features include softer lighting; a material palette that serves as a wayfinding icon; wider and longer stalls; and custom recessed toilet stall accessories, shelves, and luggage niches. Custom-sized quartz trough sinks accommodate two users at a time, who are only one step away from an adjacent paper towel dispenser. Materials are durable, elegant, and seamless, resulting in low maintenance and timeless design, and real perceptions of cleanliness. While the aesthetic is sophisticated, all surfaces were selected and detailed to withstand the quarterly “hose down.” Technology is central to the design and supports the goals of sustainability, guest comfort, and cleanliness. In addition to LED lighting and turbine powered low-flow fixtures, occupancy sensors monitor restroom use and signal maintenance crews to clean based on use/number of visitors. In addition, each set of restrooms integrates original Minnesota inspired mosaic artwork at the entrance designed by local artists. The current master plan of restroom renovations began in 2009 and will continue through 2025.